Brighton today is a far cry from the city's beginnings as two distinct and tiny Saxon fishing villages. Built on the fishing trade, much of Brighthelmstone and its economy was destroyed in the great floods of the early 18th Century. Later that century Brighton's fortunes began to change and the first steps were taken in its transformation into one of the country's most popular seaside resorts. Two piers were built before the turn of the 20th Century, providing entertainment and a focus for the new tourists. Brighton Marina is the largest marina in the UK, and one of the largest in the world. It covers 127 acres, and extends 1,100 yards along the bottom of the cliffs at Black Rock, to the east of Brighton and over 600 yards into the sea. It was originally the idea of a garage proprietor, Henry Cohen, in 1963. After a public inquiry, a town poll and two town meetings, Taylor Woodrow began work on it in March 1971. The Marina was opened to the public in July 1978, and formally opened by the Queen in May 1979. In 1985, the Brent Walker company bought it for £13 million, and began a new £120 million development programme. 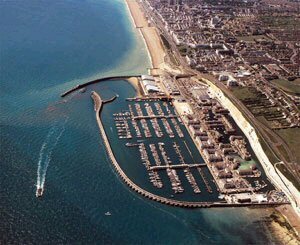 Today the marina boasts amongst other attractions a 2,200 seat multiplex cinema, a supermarket and a pub, as well as 1,500 boat moorings and a small fishing fleet. Charter boats for fishing and diving can be booked at the Marina.